Garnet color. Aromas of dried cherry, pencil shavings, and strawberry shortcake with a satiny, crisp, dryish light-to-medium body and a smooth, breezy fudgesicle and rum-soaked strawberries finish with well-integrated, medium tannins and a suggestion of oak flavor. 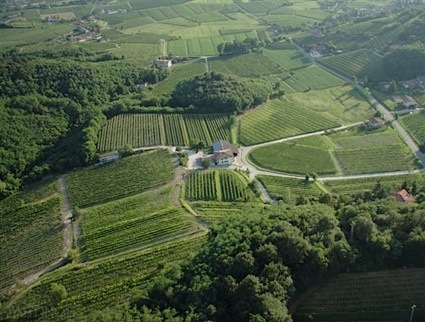 A fresh and fruity red with great versatility. Bottom Line: A fresh and fruity red with great versatility. 89 • Monte De Oro 2013 Estate Grown, Cabernet Sauvignon, Temecula Valley 14.1% (USA) $36.00. 85 • Monte De Oro 2012 Estate Grown, Merlot, Temecula Valley 14.7% (USA) $32.00. 92 • Monte De Oro 2013 "Simplexity" Estate Grown, Temecula Valley 14.1% (USA) $34.00. 90 • Monte De Oro 2013 Estate Grown, Tempranillo, Temecula Valley 13.5% (USA) $32.00. 96 • Monte De Oro 2013 Zinfandel, Temecula Valley 15.9% (USA) $33.00. 85 • Monte De Oro 2015 "Bolle De Oro", Temecula Valley 12.5% (USA) $22.00. 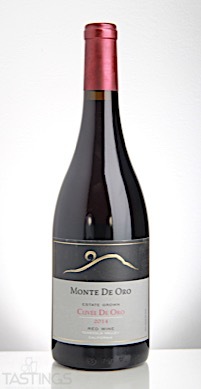 90 • Monte De Oro 2010 Reserve, Syrah, Temecula Valley 16.3% (USA) $80.00. 95 • Monte De Oro 2010 Reserve, Cabernet Sauvignon, Temecula Valley 14.5% (USA) $80.00. 94 • Monte De Oro 2014 Estate Grown, Zinfandel, Temecula Valley 16.4% (USA) $38.00. 88 • Monte De Oro 2014 Estate Grown Monte De Oro Vineyard, Tempranillo, Temecula Valley 15.3% (USA) $35.00. 94 • Monte De Oro 2014 Estate, Syrah, Temecula Valley 16.1% (USA) $36.00. 90 • Monte De Oro 2014 Cuvée de Oro Estate Grown Red Blend, Temecula Valley 16% (USA) $34.00. 91 • Monte De Oro 2012 Vista del Monte Vineyard Reserve, Syrah, Temecula Valley 15.6% (USA) $80.00. 87 • Monte De Oro 2014 Monte de Oro Vineyard Estate Grown, Petite Sirah, Temecula Valley 16.6% (USA) $36.00. 93 • Monte De Oro 2017 Galway Vineyard Estate Grown , Chardonnay, Temecula Valley 13.7% (USA) $23.00. 89 • Monte De Oro 2015 Estate Grown, Zinfandel, Temecula Valley 16.0% (USA) $44.00. 93 • Monte De Oro 2015 Estate Grown , Tempranillo, Temecula Valley 12.5% (USA) $35.00. 90 • Monte De Oro 2015 Syrah, Temecula Valley 14.6% (USA) $41.00. 88 • Monte De Oro 2015 Monte De Oro Vineyard, Petite Sirah, Temecula Valley 14.3% (USA) $38.00. 91 • Monte De Oro 2015 Cuvée de Oro Estate Grown Red Blend, Temecula Valley 13.5% (USA) $33.00. 94 • Monte De Oro 2013 Vista Del Monte Vineyard Estate Grown Reserve, Syrah, Temecula Valley 16.2% (USA) $85.00. 93 • Monte De Oro 2014 Vista Del Monte Vineyard Estate Grown Reserve, Syrah, Temecula Valley 16.1% (USA) $85.00. Monte De Oro 2014 Cuvée de Oro Estate Grown Red Blend, Temecula Valley rating was calculated by tastings.com to be 90 points out of 100 on 1/12/2018. Please note that MSRP may have changed since the date of our review.